Toilet: Ek Prem Katha Advance Booking and Screen Count Report. Toilet: Ek Prem Katha is the major release happening this Friday (tomorrow) at box office. 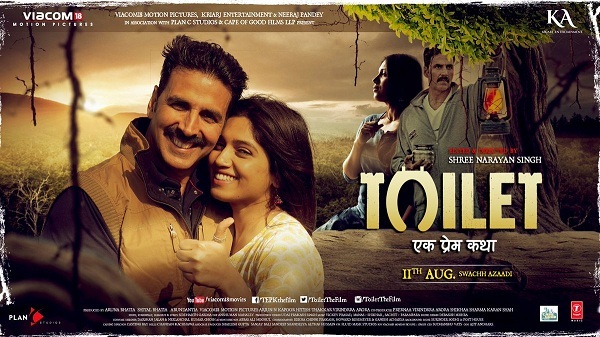 Film stars Akshay Kumar and Bhumi Pednekar in lead and buzz is extremely good. Coming to film screening. TEPK has managed a good screening of 3000 as per official update. Screen allocation is still going on and there are chances that it might vary a bit. Last week big release Jab Harry Met Sejal fared poorly at ticket counters and hence, TEPK has been benefitted from it. Coming to advance booking report of TEPK. Major all India advances of TEPK is opened on Thursday (today) only. Hence, advances are still low and definitely picking up. Still few hours left for start of first shows and hope advances increases rapidly. As per last report of 8 pm, TEPK has registered an advance of 15-16% for Friday (1st day). This is a low figure. However, film stars Akshay Kumar whose film mostly depends on spot booking rather than advances. Also, if film carries good report and then expect occupancy to increase in later half of Friday for sure. Considering tomorrow is normal weekday, advances are decent. But still it could have been better as film trailer is mostly liked and well appreciated. Good news is that advances for Friday Evening and Night shows are much better. Means, family audiences are quite interested for the film and if film reports are positive, then we might see good growth through the opening weekend. There is no doubt TEPK will open slow in Morning shows, but definitely pick up through the day. Just hope that initial reports of the film are decent to good. Industry badly needs a HIT right now. Toilet: Ek Prem Katha Screen Count - 3000 (expected). Saw the movie in Dubai. National award winning movie for sure. Excellent message. Anju has left all his contemporaries way behind. 4 out of 5 stars.